The day I graduated in 1992 is the day I began looking for natural approaches to help my patients. I have tried just about every combination of vitamins and minerals in an effort to improve ocular and overall health. I started the Fortifeye Vitamin company and became a certified nutrition specialist in my quest to find the nutritional answers I was looking for. I have been involved and am currently involved in ongoing nutritional research aimed at helping patients. Since I live and practice in Florida one of the biggest problems I encounter with my patients is dry eye syndrome. The Lange Eye Institute in The Villages Florida is a destination for many looking for a more natural approach for there dry eye problems. It seems that just about everyone in the Florida area has some form of dry eye and some are quite severe and debilitating . 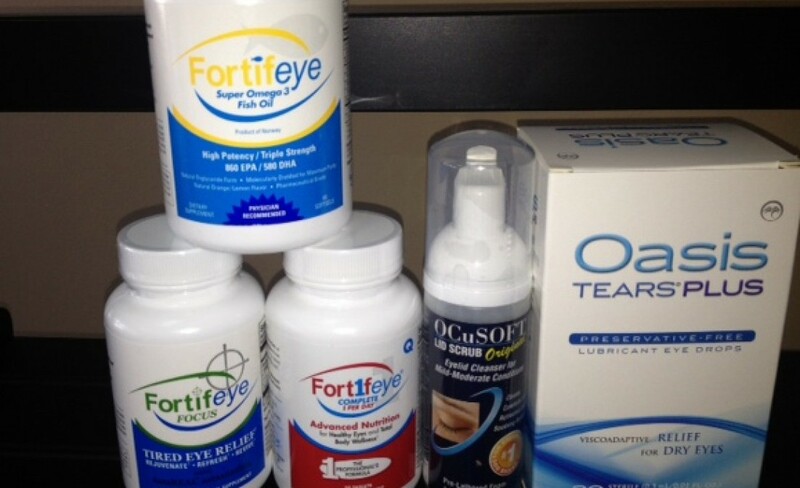 Dry eye nutrition is an area I have been involved in for numerous years. I have developed and re developed many dry eye vitamins over the years and finally I am able to make recommendations to patients that really works. I started an omega 3 index study years ago and found that the majority of my patients were omega 3 deficient. Most of these patients were taking some form of omega 3 supplement they bought from the local drug store or bought off an infomercial or the internet. Surprisingly even though they were taking omega 3 supplements they were still deficient. I went on a fact-finding research trip to Norway and visited the leading omega 3 factories in the world. I gained some valuable knowledge on this trip and I started using the triglyceride form of omega three fish oil in much higher concentrations and found that my patients omega index started to rise. The omega index is the ratio of omega three to omega six in the blood. I also noticed that many of my patients that had low omega index also had quite dry eyes. Once we were able to bring their omega index over 9% many of these patients dry eye symptoms would start to vanish. All of this new insight into omega 3 and the potential it had to help patients with dry eye sparked my interest in developing a super potent triglyceride form omega 3 supplement. In early 2010 I formulated Fortifeye Super Omega. I took all the information I had researched and put it all into this formula. Fortifeye super omega is a triglyceride form Omega 3 fish oil derived from small non predatory fish like sardines and anchovies. It has been purified through a triple distillation process that is free of essentially all potential contaminants. I have made it so it is in a chewable from that has a very good taste for those that have difficulty swallowing pills. After development I did an omega index study to prove that it had a therapeutic effect. In our study of approximately 100 patients everyone in the study that was 240 lbs or less registered an omega index over 9% after one month of being on two per day dosage. This proved to me that Fortifeye Super Omega could make a difference. Well after 5 years we have 1000s of doctors and patients that are taking Fortifeye Super Omega throughout the world. Many patients with dry eyes have improved dramatically by consuming the appropriate form and concentration of omega 3. Number one on my list for dry eye vitamins would have to be Omega 3 fish oil in the triglyceride form. I recommend taking an EPA of 850-900 and a DHA of 550-600 for the typical person weighing less than 240 lbs. If you have mild dry eyes I think this is enough omega 3 however if you have marked dry eyes then I will double the amount of omega three to four per day dosing which is in a range of 1700 -1800 EPA and 1100-1200 DHA. These ratios of omega 3 have been used successfully on 1000s of patients. The key here is to take Fish oil in the re esterified triglyceride form not the ethyl ester form. This form of fish oil absorbs much more readily and is much more stable and thus no nasty burp back. The majority of omega 3 fish oils you can purchase otc are the ethyl ester form and are relatively weak concentrations. Please stay away from krill oil since there isn’t a krill on the market that I am aware of that has anywhere near the amounts of omega 3 that you need to realistically help dry eye syndrome. These concentrations of omega-3 will help with ocular surface inflammatory conditions like Meibomian gland dysfunction, dry eye syndrome and blepharitis. Most of my patients will do extremely well with this regiment if they have dry eyes as long as they practice good lid hygiene and use a good unpreserved artificial tear like Oasis tears plus, Blink Preservative free or Retaine. However in some very stubborn cases of dry eye I will add GLA from Black currant seed oil to stimulate Series one prostaglandins , PGE1, is the anti inflammatory pathway of the omega six pathway. I like a ten to one ratio of omega 3 to omega 6 (gla) so 1600 mg of omega 3 to 160 mg of GLA from black currant seed oil. Lastly most dry eye patients are dehydrated and therefore can also be deficient in potassium. Dehydration and potassium deficiency can be contributing factors to dry eyes. So I recommend they drink at least two large glasses of organic coconut water to help hydrate and gain some potassium and also drink half their body weight in ounces of glass bottled spring water or carbon filtered well water. To learn more about dehydration and dry eye go to www.dryeyenutrition.net , or www.dryeyenutrition.org . So in summary take a good triglyceride form omega 3 fish oil 2-4 per day (fortifeye Super Omega), take 6mg of astaxanthin (Fortifeye Focus), a good multivitamin/ eye vitamin ( Fortifeye once daily or fortifeye complete, a non denatured whey protein concentrate from grass-fed A2 cows ( Fortifeye Super Protein) shake once a day, drink a couple of glasses of organic coconut water a day and finally 160 mg of GLA combined with the rest if dry eyes still a problem. I also recommend changing to an Organic, gluten-free Paleo diet to help with dry eye as well as overall health. When snacking be very careful because most snacks are filled with pro inflammatory ingredients. I love paleo bars and Paleo crunch from a company called Paleo Simplified. Their paleo bars use the best superfood and are low glycemic index with no binders , fillers or toxic dyes. Paleo Simplified is a great snack for everyone that actually has potent antioxidant and anti inflammatory effects. Learn more at Www.paleosimplified.com. Tags: astaxanthin, astaxanthin helps improve muscle endurance, astaxanthin is a super potent antioxidant, blepharitis, decreases symptoms of dry tired eyes, dr michael lange, dry eye, dry eye nutrition, dry eye patients, dry eye patients are dehydrated, dry eye syndrome, dry eye vitamins, dry tired eyes, fortifeye complete one per day, fortifeye focus, Fortifeye super omega, GLA from black currant seed oil, glutathione, glutathione levels decrease with age, good lid hygiene, grass fed non denatured whey protein concentrate, grass fed whey protein, marked dry eyes, meibomian gland dysfunction, mild dry eyes, non denatured whey protein concentrate form grass fed A2 cows, non denatured whey protein concentrate from grass fed A2 cows, non denatured whey protein concentrate from new zealand grass fed A2 cows, oasis tears plus, omega 3, omega 3 fish oil, omega index study, omega three fish oil, paleo diet, paleo diet to help with dry eye, pge1, re-esterfied fish oil, series one prostglandins, symptoms of dry tired eyes, triglyderide form omega three, whey protein concnetrate from grass-fed a2 cows | Permalink.